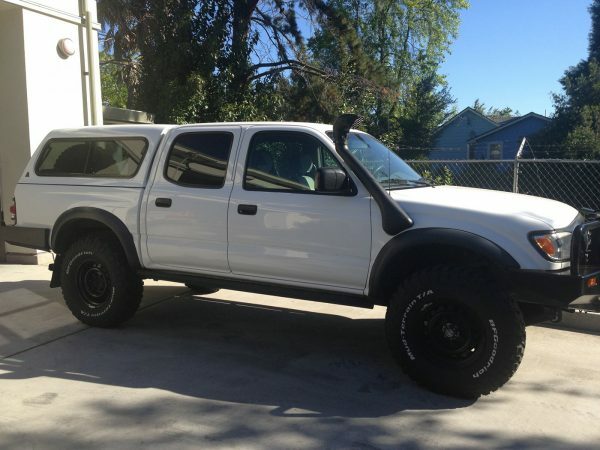 This is a nice looking 2004 Toyota Tacoma DoubleCab that the owner reportedly converted to PreRunner 4×4 spec using all Toyota 4WD parts. It has a 2.7-liter, 4-cylinder motor, and an automatic transmission. The truck has all kinds of overlanding goodies, like an ARB front bumper, an Outdoor Logic rear bumper with swing out, a Safari Snorkel, ARB front and rear locking differentials with 5.29 gearing, a complete OME suspension, and BudBuilt skid plates. It looks like it’s been set up right. The diff. breathers are said to be routed to under the hood and the effect of the larger 255 BFG Mud Terrains has been corrected by a Dakota Digital speedometer calibrator. I like the little touches like the front-mounted hitch receiver under the license plate and the black Toyota trim. The truck has 225,000 miles, but on a truck that’s been well maintained, I no longer see that as an issue. Just keep up the maintenance and drive it. The truck is located in Modesto, California and available for $14,000. As is usually the case, you couldn’t build it for the asking price. See the original ad text at the end of the post.